The multi-genre lineup included nearly 40 headliners who entertained concertgoers both on the main stage at the MGM Grand in Las Vegas on the evenings of September 19 and 20 and at the iHeartRadio Music Festival Village on Saturday afternoon. Performers included Taylor Swift, Coldplay, Usher, Ariana Grande, Nicki Minaj, Mötley Crüe, Zac Brown Band, One Direction, Ed Sheeran, Paramore, Iggy Azalea, Train, Eric Church, Lorde, Calvin Harris, Bastille, Steve Aoki, 50 Cent, Weezer and more. More than 20,000 music fans experienced the amazing two-day event LIVE, including thousands of broadcast radio listeners from across the country who won all-expense-paid dream trips to Las Vegas as part of iHeartMedia’s summer-long on-air and online promotion. The millions of fans not in Las Vegas to experience the Festival in person were able to listen and watch the iHeartRadio Music Festival live across iHeartMedia’s more than 850 radio stations in over 150 markets and via the Yahoo Live (http://yahoo.com/iheart) stream. In addition, the Festival will also return to The CW Network as an exclusive two-night television special on September 29 and 30 from 8:00-10:00 p.m.
Once again, the iHeartRadio Music Festival featured a host of thrilling collaborations and special guest appearances including Steve Aoki and Will.i.am; Ariana Grande and Childish Gambino; Usher and Chris Brown; 50 Cent and G-Unit; Ed Sheeran and Macklemore; and Calvin Harris and John Newman, who closed the 2014 Festival. 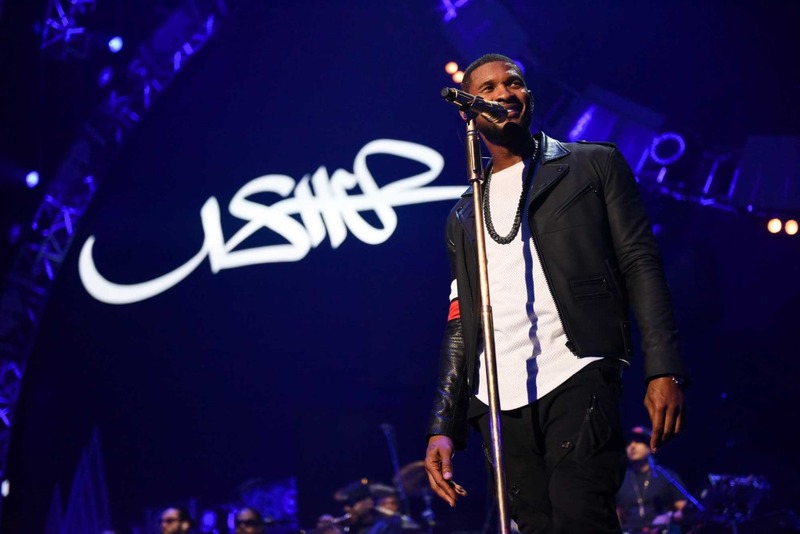 Additionally, Jason Derulo, Alicia Keys and Lil John were surprise guest performers. The Festival drew a large number of celebrity presenters and attendees including iHeartMedia on-air personalities Elvis Duran, Bobby Bones and DJ Prostyle, Pete Wentz, Nick Jonas, Fergie, Chris Pratt, Sophia Bush, Laverne Cox, Nick Cannon, Hilary Duff and more. Taylor Swift was honored by the Recording Association of America and iHeartRadio to commemorate Big Machine Record’s “Shake It Off,” which was the fastest certified platinum song in 2014 and the first artist to debut No. 1 on the iHeartRadio chart. The iHeartRadio Music Festival Village returned to The Lot across from Luxor Hotel & Casino on Saturday afternoon with live performance by Iggy Azalea, Neon Trees, Kacey Musgraves, Childish Gambino, Magic!, The Pretty Reckless, Nico & Vinz, Lil Jon and a surprise collaboration between Fences and Macklemore. The afternoon event also featured fan zones and interactive experiences by iHeartRadio’s brand partners. The iHeartRadio Music Festival is co-produced by John Sykes, President of Entertainment Enterprises for iHeartMedia, and Tom Poleman, President of National Programming Platforms for iHeartMedia. For more details about the iHeartRadio Music Festival visit iHeartRadio.com/festival. With 245 million monthly listeners in the U.S., 97 million monthly digital uniques for iHeartMedia Digital and 196 million monthly consumers of its Total Traffic and Weather Network, iHeartMedia has the largest reach of any radio or television outlet in America. It serves over 150 markets through 859 owned radio stations, and the company’s radio stations and content can be heard on AM/FM, HD digital radio, satellite radio, on the Internet at iHeartRadio.com and on the company’s radio station websites, on the iHeartRadio mobile app, in enhanced auto dashes, on iPads and smartphones, and on gaming consoles. iHeartRadio, iHeartMedia’s digital radio platform, is the No. 1 all-in-one digital audio service with over 345 million downloads; it reached its first 20 million registered users faster than any digital service in Internet history and reached 50 million users faster than any digital music service and even faster than Twitter, Facebook and Pinterest. The company’s operations include radio broadcasting, online, mobile, digital and social media, live concerts and events, syndication, music research services and independent media representation. For more information visit our website at iHeartMedia.com.